Is your mouth-watering??? Mine too! I am a huge fan of dip. And of cheesecake for that matter. A combination of the two…genius! But I can really do without all of the extra sugar…and so can my toddler. Harper loves fruits. All fruits. All the time. 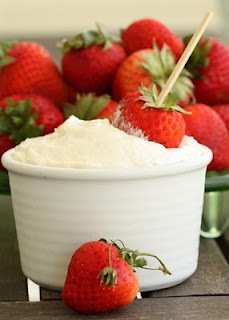 But last night I wanted to treat her (and secretly myself) with one of my favorites, cheesecake fruit dip with strawberries. I found a recipe several months back for this delicious dip and last night I finally decided to make it. But I tweaked it a bit and it turned out better than I could have imagined. This recipe yields about two servings (one for Momma and one for Baby) and has less than 2g of sugar, less than 4g of carbs, and less than 60calories per serving. Add all the ingredients in a small bowl and whisk, whisk, whisk.